These notable Latino markets will help fill everyone's stomachs, whether you're a connoisseur of Central and South American food or know nothing about it. Grand Rapids is home to a diverse Latino population from Mexico and Central and South America. Furnishing this community from across the globe with familiar grocery products and essential Latin-cooking ingredients are a number of Latino grocery stores that span the city. Each with their own unique flavors and many with fresh baked goods or fried food, these grocery stores are a must-visit, regardless of your heritage. Curious or connoisseur, check out the guide below for an introduction to Grand Rapids' notable Latino markets. Home to fresh bakery items (at two for $1 on Tuesdays), a variety of deli meats, including hard-to-find delicacies such as tripe and Rico's Tacos, a counter serving up fresh tacos and other Hispanic food, this grocery just about has it all. With public notary services, lottery tickets and fresh produce, in addition to a variety of Latin American packaged foods, customers need not travel further than this one-stop-shop. Forget “Cheers” — Burton Meat Farm truly is the place where everybody knows your name. 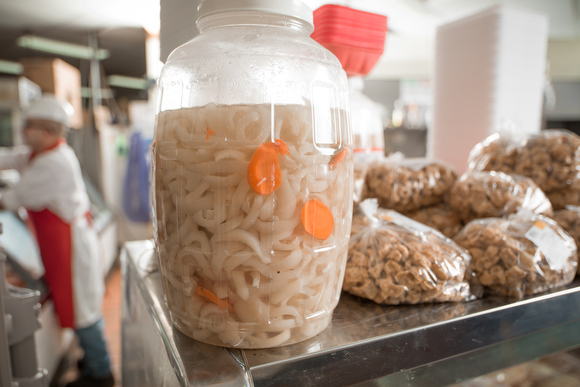 Almost everyone who enters this family-owned and operated Latino specialty food store is greeted by name, with the owners often stopping to ask about the families of customers who hail from throughout Latin America. 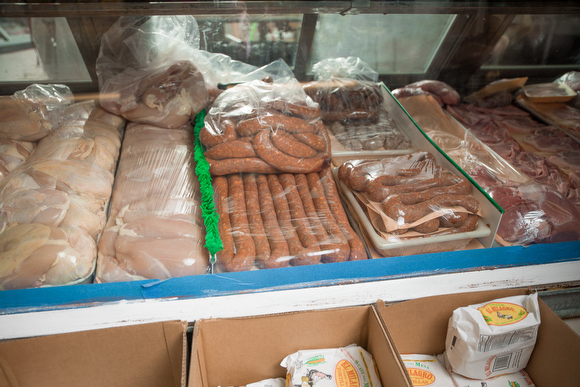 Besides the friendly staff, the shop is known as one of the finest butcher shops in West Michigan, featuring a meat case full of hand cut beef, pork, goat, and poultry. The shelves are fully lined by international spices and seasonings, and there’s a wide selection of fresh produce, including such specialties as yuca and green plantains. While you’re there, be sure to check out the variety of prepared meals, including rice with pigeon peas, menudo, tamales, beef fajitas, fresh guacamole and fried pork belly (chicharones). Smack dab in the center of Grand Rapids' Hispanic community and just down the road from Grandville Avenue staples, such as the Cook Arts Center and the Hispanic Center, lies the National Supermarket. This large grocery store’s shelves are packed with items from Mexico and other South American countries and fun, hard-to-find gems like chocolate Lucky Charms and Dora the Explorer cereal. In addition to a large deli case, National also carries a variety of fresh produce and must-have ingredients, such as queso fresco (a soft, creamy cheese common in Latin American cuisine). Be sure to also try unique treats like mango con chili (dried chili spiced mango) for a kick. A large grocery by downtown standards, this South Division supermarket includes fresh produce, dry goods like pumpkin seeds and chilies, a fully stocked deli and fresh fried chicken and chicarrónes (fried pork belly). Rodriguez Supermarket also provides fresh baked goods, like caramel-flavored puercocitos ("little pigs," or pig cookies). In a small section of the store, customers can also buy lottery tickets, relax, take a seat and enjoy fresh food items. The leading market for Mexican products in Grand Rapids, the first Supermercado Mexico has expanded over the past decade to three locations, and now includes the recently acquired La Mexicana Bakery. 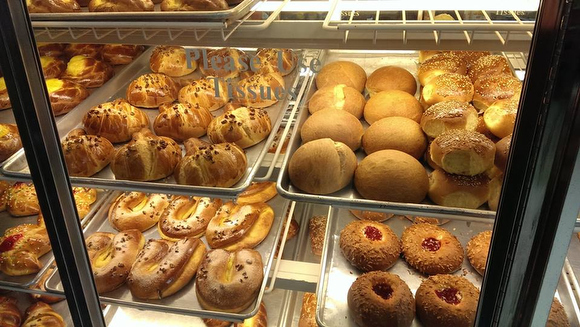 President and owner Javier Olvera acquired the bakery in 2014 and put master baker Miguel Perez at the helm to offer tasty Mexican creations. Providing mainly Mexican products—including grocery items, freshly baked pastries and a variety of deli products—Olvera notes, "We specialize more in the Mexican community." The Clyde Park Avenue and Chicago Drive locations are the larger of the three stores, while the Division S. location, housing the bakery, is slightly smaller with more basic items. At the corner of Diamond and Fulton, just down the road from the Fulton Street Farmers Market, sits this friendly and cozy store. A convenient stop for busy Midtown and Eastown residents, Tienda has select grocery and convenience items. The owner, of Guatemalan and Mexican descent, distinguishes his shelves with mostly Guatemalan items, as well as products from Mexico, Peru and El Salvador. The free parking at this busy Diamond and Fulton intersection also doesn't hurt.